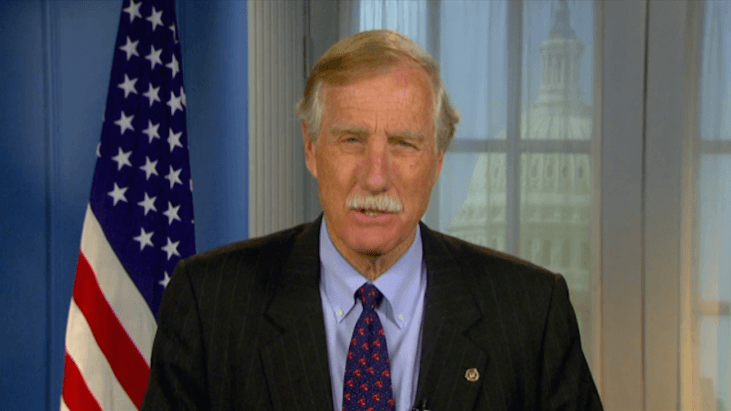 Like a lot of men, Maine Sen. Angus King will again be undergoing treatment for prostate cancer. Prostate cancer is the most common cancer among American men, aside from skin cancer, and recurrence is not uncommon. Sen. King announced that he is beginning an 8-week round of radiation therapy for recurring prostate cancer — but made it very clear that the treatment will not affect his ability to serve on the Senate. Sen. King was originally diagnosed with prostate cancer in 2015. He had his prostate gland removed and had been cancer-free since then. However, he decided to resume treatment when his doctors noticed a slightly elevated PSA level, according to a statement from his office. Most doctors will recommend men get regular screenings every six months after treatment, even if the prostate is removed. PSA stands for protein-specific antigen, and is the name of a protein secreted by the prostate gland. The PSA test is a simple blood test that’s used to screen for prostate cancer and also to track a patient’s response to treatment. Men have a small amount of PSA in their blood at all times, but large amounts may signal that something is brewing. When cancer cells grow, PSA begins to spill into the blood at higher levels. It’s important to note, though, that an elevated PSA test does not always mean a man has prostate cancer; it can simply mean that the prostate is infected, inflamed, or enlarged — which is quite common. In Sen. King’s case, the lawmaker explained in his statement that the treatment is “more like maintenance.” The 74-year-old senator began treatment on Jan. 14 and will get his last dose of radiation in mid-March. Side effects of radiation therapy for prostate cancer can be similar to those of surgery, including bowel, urinary, and sexual function issues. Sen. King was elected to a second six-year Senate term this November.